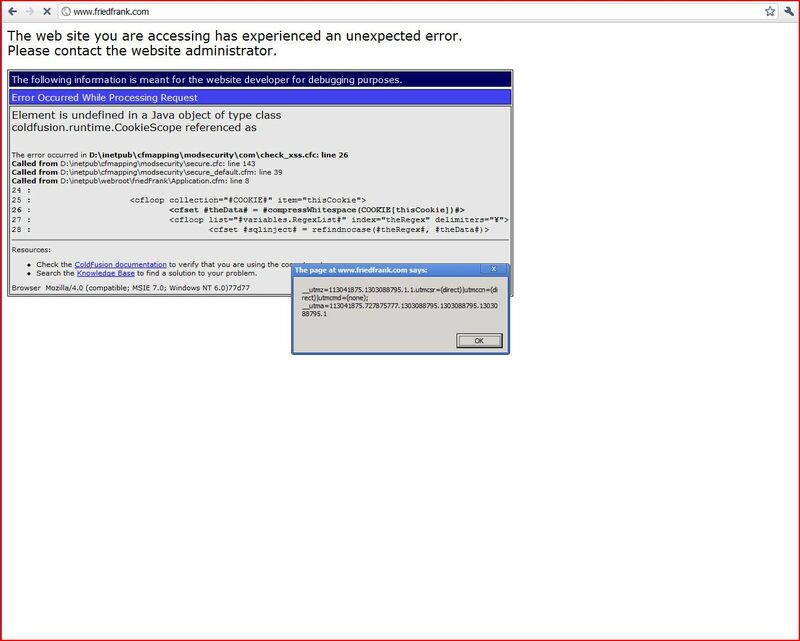 Report generated by XSS.CX at Mon Apr 18 10:14:46 CDT 2011. The name of an arbitrarily supplied request parameter is copied into the value of an HTML tag attribute which is encapsulated in double quotation marks. The payload 5bd98"><a>d763519c72f was submitted in the name of an arbitrarily supplied request parameter. This input was echoed unmodified in the application's response. The value of the more request parameter is copied into the value of an HTML tag attribute which is encapsulated in double quotation marks. The payload 83c9c"><a>23920438f4a was submitted in the more parameter. This input was echoed unmodified in the application's response. The name of an arbitrarily supplied request parameter is copied into the value of an HTML tag attribute which is encapsulated in double quotation marks. The payload 1499e"><a>e4e0d068b9f was submitted in the name of an arbitrarily supplied request parameter. This input was echoed unmodified in the application's response. The value of the User-Agent HTTP header is copied into the HTML document as plain text between tags. The payload 77d77<script>alert(1)</script>d7124e24d9 was submitted in the User-Agent HTTP header. This input was echoed unmodified in the application's response. The value of the User-Agent HTTP header is copied into the HTML document as plain text between tags. The payload 1dfa8<script>alert(1)</script>89a12df46cb was submitted in the User-Agent HTTP header. This input was echoed unmodified in the application's response. The value of the User-Agent HTTP header is copied into the HTML document as plain text between tags. The payload 8e740<script>alert(1)</script>1b6d2f1cdba was submitted in the User-Agent HTTP header. This input was echoed unmodified in the application's response. The value of the User-Agent HTTP header is copied into the HTML document as plain text between tags. The payload c2767<script>alert(1)</script>7516a2e75de was submitted in the User-Agent HTTP header. This input was echoed unmodified in the application's response.